I love giving handmade gifts when I can, and a handmade gift is even more fun to make when the recipient is a baby. My daughter's school administrator is expecting her first child, a little boy. This lady works very hard to run the daycare center smoothly and to plan wonderful activities for the children, so to express our good wishes, I decided to make her a baby quilt. I asked her if she had any favorite nursery colors and was told that they wanted the baby's room to be bright and colorful (good answer!) and this fabric panel immediately came to mind- I bought it just last month from SR Harris in MN. 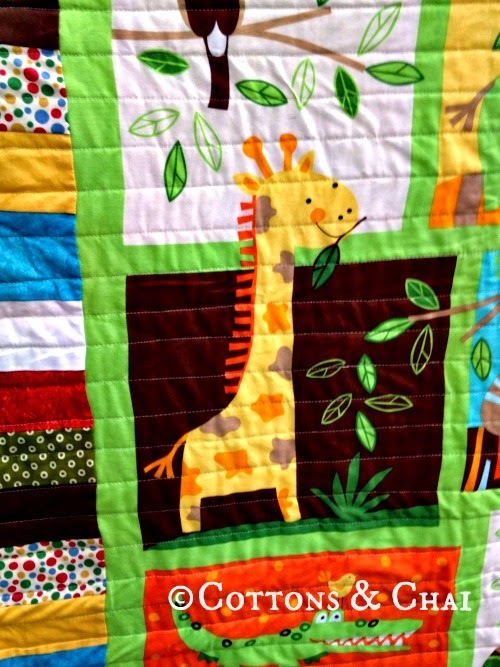 Panel quilts are quite wonderful for making gift quilts. I'm eager to put in love and time and effort but it just wouldn't be practical to spend months making a quilt. Printed panels give me a starting point for the quilt but I still have the opportunity to make it my own by adding blocks, sashing and borders. 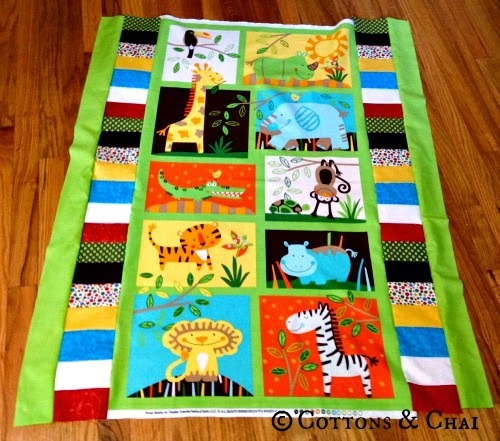 This panel is called Jungle Bunch by Wendy Bentley for Timeless Treasures. The vibrant colors and happy animals are adorable. The starting panel was 24 inches wide and 44 inches long. To add some width, I added a piano key border. 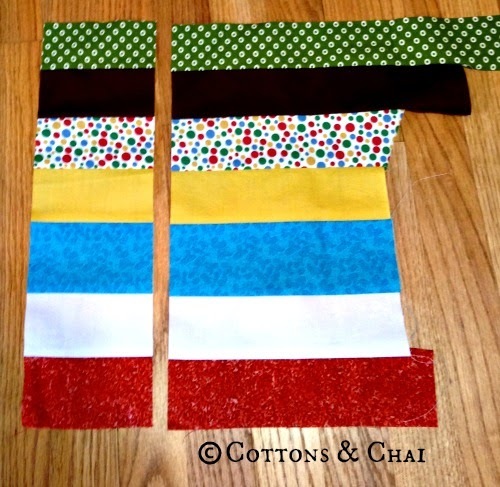 A piano key border is made of strips of bright, contrasting fabrics. I started by rummaging through my very modest fabric stash for a handful of fabrics that coordinated with the colors of the panel. Then I cut strips 3.5 inches wide x width of fabric and sewed them together. This long striped fabric was then sliced into 4 inch wide pieces that I joined together lengthwise to form a repeating border for each side. I thought I would have to buy a package of batting, but realized that I had a large strip of batting left over from another project- if I cut it in half vertically and sewed the halves together on top of each other using mattress stitch, I'd have just the right size of batting for this quilt. So that's what I did! 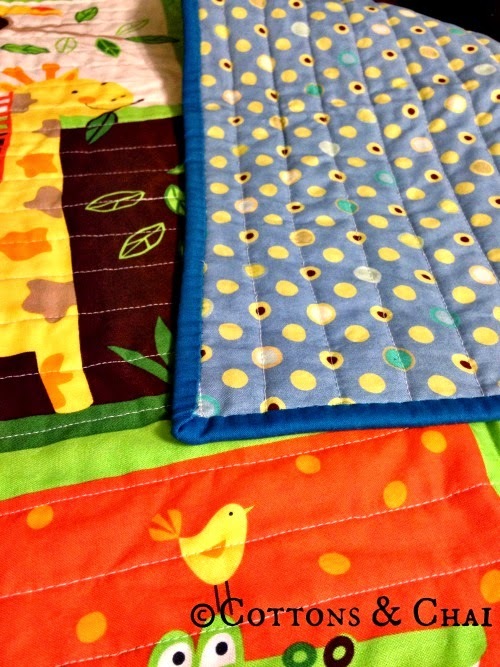 After all, quilting is all about economy and making good use of what you have. In that same spirit, the backing was a large polka dot yardage that I had bought in a yard sale earlier this month- someone was de-stashing some great quality fabric! Not my strong point! But straight line quilting I can generally manage. After making the quilt sandwich, I drew horizontal lines 1 inch apart. Then starting at the middle, I started to quilt over the lines. Two tips here: use a longer stitch length than usual (I used 4.0 mm) and quilt alternate lines, then go back and quilt the ones you skipped. 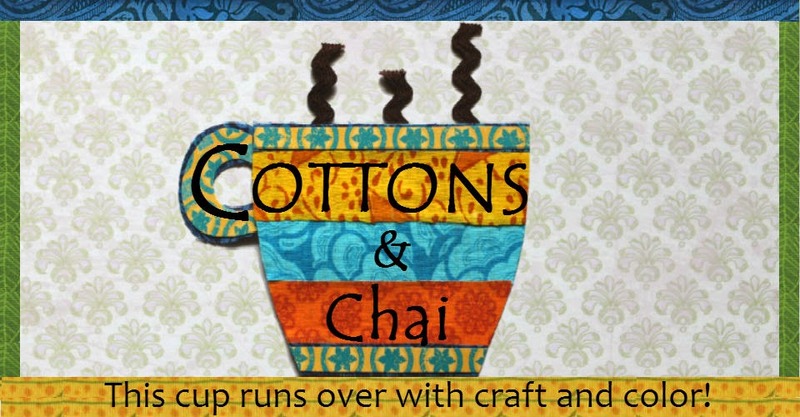 This makes for more even quilting. I finished with a bright blue binding. 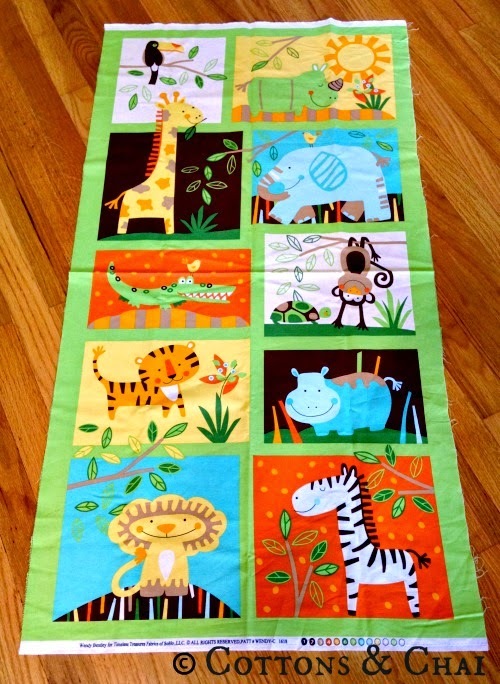 The quilt is 36 inches wide and 42 inches long, which I feel is the perfect size to last a baby into the preschool years. 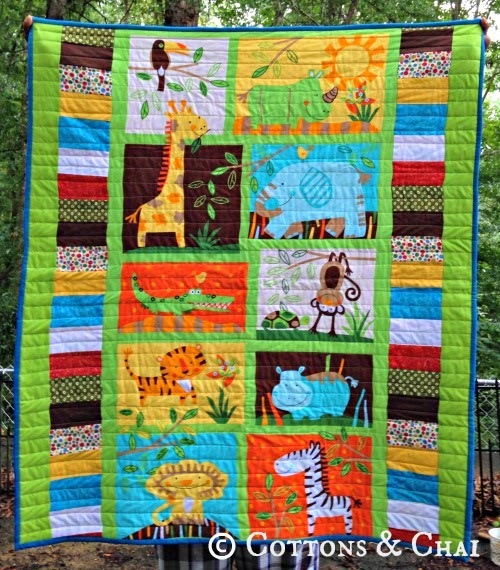 Nupur, this is such a beautiful and colorful quilt! I am sure this will become the baby's favorite in no time. The piano key border on the side was a great idea, it really looks great with the Jungle Bunch pattern! i am sure the would-be mother was thrilled to receive it.